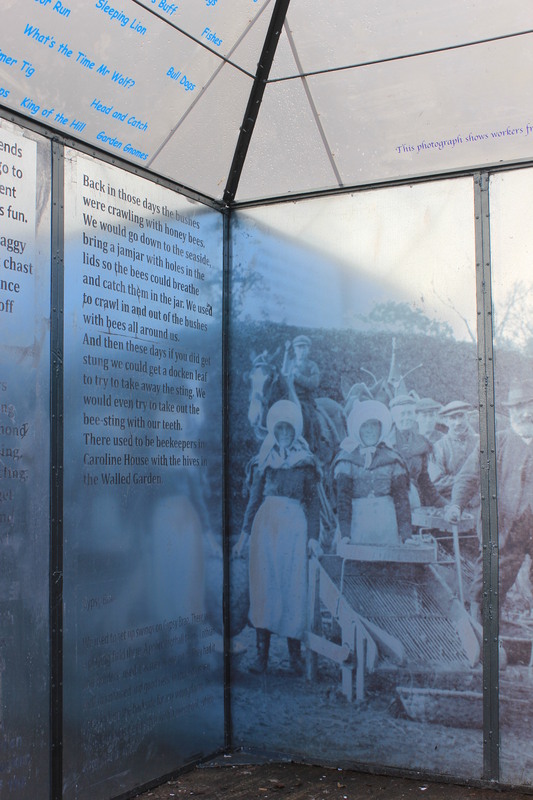 Visitors to the garden here at NEA might remember that our bespoke greenhouse was unfortunately burnt down last summer. Natalie (garden artist-in-residence) has been hard at work since last autumn creating a revamp of the greenhouse structure. Inspired by the themes of play and land use, Natalie has created a sitooterie (somewhere to sit outside) that explores the local social history of the outdoors and nature. We’ve named it the Phoenix Sitooterie, reflecting its rising from the flames of the old greenhouse. 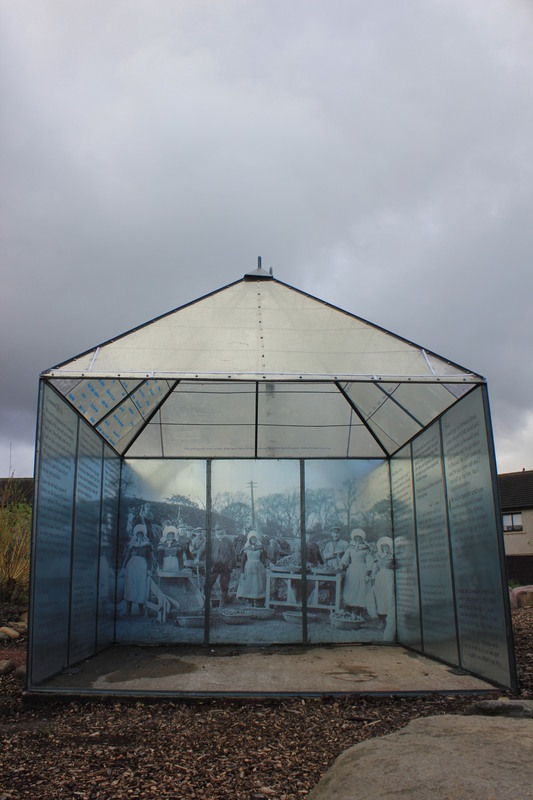 The existing metal structure has been refurbished with three walls made of galvanised steel panels. 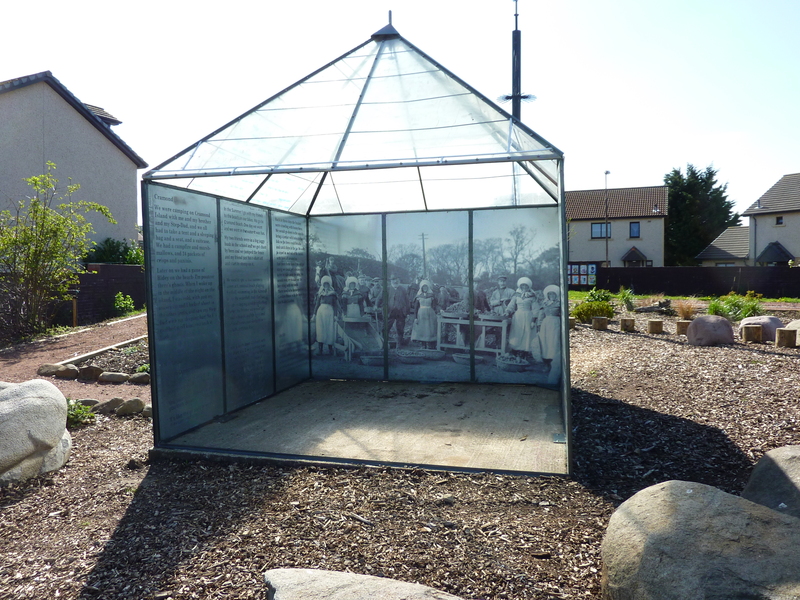 On one panel, a photograph showing potato farmers from West Pilton circa 1914 has been printed. 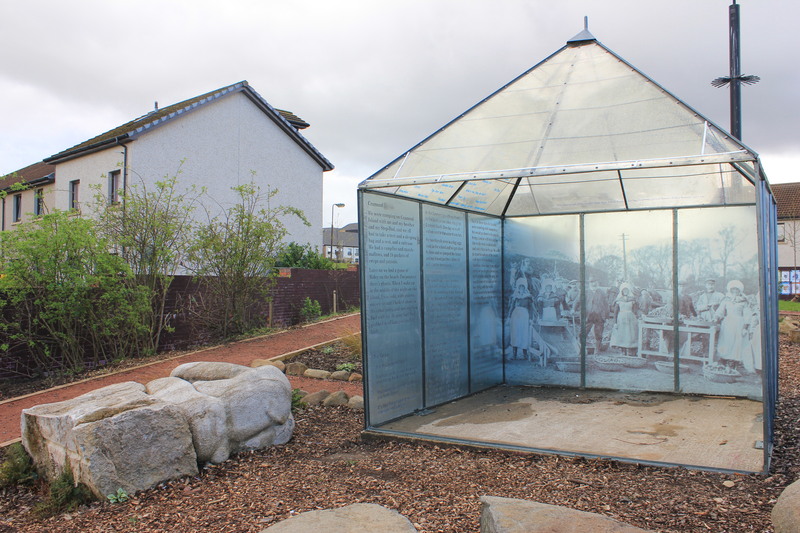 The other two sides are covered with stories of play gathered from two generations of local people: older people who remember playing in the area before the housing was built and the land was still fields, and the generation currently playing in the garden (mostly from children taking part in workshops with Natalie and storytellers Virginia Radcliffe and Ryan Van Winkle at St David’s RC and Craigroyston primary schools). The roof has been constructed out of old bus shelters, fitting with NEA’s focus on sourcing reusable/recycled materials, rather than new materials, as much as possible. It’s a wonderful addition to our garden and a reminder of the different ways we use outdoor space – for growing food and for play, for leisure and for work. All of which the garden at North Edinburgh Arts is indeed used for!